My photo’s just doesn’t do this polish justice. It is absolutely stunning! I applies three thin coats plus top coat here. What’s your number one lemming? What polish do you just NEED to have in your life? 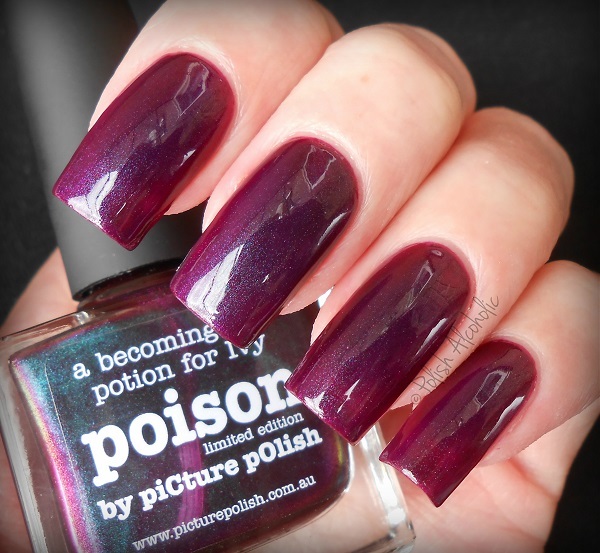 This entry was posted in piCture pOlish and tagged chameleon, picture polish, picture polish poison, poison, review, swatch, swatches, vampy, vampy chameleon by Polish Alcoholic. Bookmark the permalink. Oo I have a lot of lemmings hey! One of the tops is CG – Wish upon a Starfish AND Point me to the Party! I also want OPI’s Alcatraz Rocks! That is so cool! I’m about to do me some indie shopping myself, I want to try out some brands I keep hearing about but I’ve never actually ordered any yet. And I love those polishes too! But at $50 a pop there expensive! Like you though, since red is the signature color of the shoe soles, I just want one bottle of the red polish, if for no other reason then to just display it cause it’s so pretty!